Q:I need 40 elephants how many I can do order please ? A:Please type "40" i f you desire 40 elephant candles into the quantity box. Q:Just ordered these. How big are the candles? A:They are sold in sets of 4, but each candle is individually packaged. The elephant is available as shown. Q:I'm doing a grey and yellow baby shower theme. Do the elephants come in yellow or blue color accents? A:Unfortunately, these come as is. 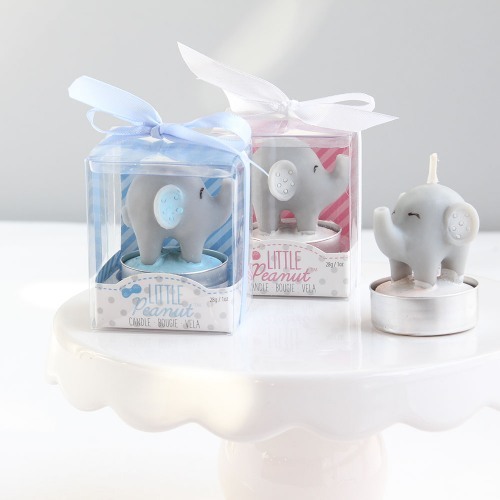 This adorable little elephant candle will light up any baby shower! Each candle comes in a gift box and tied with an organza ribbon. Pair this gift with a set of personalized matches for a truly delightful baby shower favor.